The situation with the refugees in Europe and especially in the Mediterranean area is out of control, doesn’t matter in how many ways officials try to veil reality. And it is not only about the hundreds dead and the tens of thousands moving everyday but it has also become a huge internal crisis for all the European states. While the Finnish government is trebling under the weight of the disagreement if they are going to take 2 or 3,000 refugees till the end of this year, there is an island in Greece that receives in average 5,000 refugees a day. The numbers themselves are devastating. And there are hundreds of thousands on the other side of the Aegean Sea waiting for their turn to board suicide boats trying to reach …freedom and safety in Europe. Greece cannot deal with the problem anymore. Was never prepared for that and especially under the current economic and social situation - still deep into the debt-crisis - it is at least unrealistic to expect any kind of solutions from the Greek government. The only thing Tsipras government can do is damage control and give urgency temporary solutions. But the hundreds of thousands of refugees cannot survive with urgency temporary solutions. Their situation is not temporary. They are not going to return to Syria next week or at least in a month. After continues lessons the last few decades, from Somalia and Ethiopia to Iraq and Afghanistan, even to Chile and Argentina, we all know that this a process that will take years - if not decades - and in the meantime a lot of them will not only search for a temporary host but for a new country and a new identity. In most European countries nowadays we are talking about second generation Iranians or Sudanese; people who have never even visited their parents’ country and identify themselves as citizens of their new country. The same time saying that governments like the Hungarian, the Polish or the Latvian act anti-European is like giving a false alibi to them. They don’t act anti-European, they are racists and fascists; and their acts have global effect, their acts is not just an EU internal problem. Likewise, the refugee problem is global and it should be dealt as that, and not as a local problem with local solutions. Localizing the problem we manage to postpone any kind of solution. And while we are trying to find who and how, more refugees arrive in the Greek islands with a no-return ticket and as it is natural while the first ones had to deal with a lot of difficulties, later the thousands had to deal with a lot of complications, now they with the refugees tens of thousands, they deal with often inhuman situations, and under the circumstances ...with nobody really to blame. 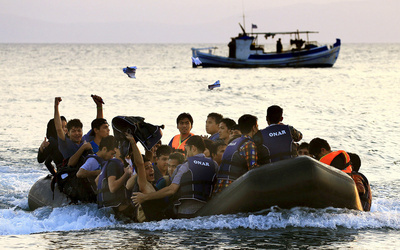 Isolated islands of 2 or 3,000 residents cannot handle 2 or 5,000 new refugees a day. Period. But before going any further, before see them and help them, let’s stop and take a couple of steps backwards. These people didn’t put their kids in boats outside bombed Damascus, ruined Baghdad or destroyed Kabul. They actually bought the boats and the lifejackets Cumberbatch describes in Turkey. And we are not talking about modern safe boats. We all know by now that we are talking about old, half destroyed inflatable boats able to barely sail a few miles, hardly reach the Greek coast and then ...sink. As far the lifejackets, even Turkish merchants have already admitted in globally televised reports, that these cheap lifejackets are not able to keep anybody out of the water for more than five minutes. Maximum! After that they become a weight themselves that drowns them down in the bottom of the sea. Still, more and more shops that sell this kind of boats and these kind of lifejackets open in the coast of Turkey, just opposite of the Greek islands. Under the license and the supervision of the Turkish authorities. This is where you stop out of embarrassment as a human being and citizen of this earth. These people left their destroyed and murderous country to save their life and their children’s lives, carrying with them their most valuables - cash, gold or jewellery - hoping to use them for their new beginnings and all that in search of a safe settler in Europe. On their way they found out that they have to cross a sea into their reach for the holy-land and ...licensed and under the protection of the authorities’ merchants, were going to sell them the "right" equipment to get to their target. After charging them unbelievable prices were they used most of their most valuables - cash, gold or jewellery - these licensed and under the protection of the authorities’ merchants sell to them useless equipment that actually endangers their life the same way the bombs endangered them in their ruined countries and that fully aware of what they are doing. Dispirit people follow dispirit solutions; and these people are dispirit people. So they buy the boats and the lifejackets hoping that everything they heard or they suspect about these licensed and under the protection of the Turkish authorities’ merchants, is just a rumour. Hundreds the numbers of dead the last two years in this crossing. We all shed tears for the drowned Aylan Kurdi but Aylan was - and unfortunately is – not alone. While I write these words, more Aylans cross the waters of the Aegean Sea, on suicide boats wearing useless lifejackets. EU leadership (presidents, commission, parliament, foreign ministers etc.) can see all that. They know what's going on in Turkey with the licensed and under the protection of the authorities’ merchants and they know that in some kind of master-plan that serves the interests Recep Tayyip Erdoğan, the Turkish president or the New-Ottoman Sultan. but they do nothing to control the situation. On the contrary it is like they do everything they can to fall into his agendas. In the meantime the situation works for him just fine. Turkey has become the first stop for the people escaping from Iraq, Syria or Afghanistan and nopbobdy can stop that but it is the “good” merchants who have become the tool to push the waves of refugees away from Turkey. Actually Turkey has played a very strange role in the region with the whole crisis. While against Assad’s regime, in the beginning helped ISIL that also seemed to fight against the Syrian dictator. Later when ISIL was promoted from anti-Assad fighters into terrorists and the nightmare of the region, Turkey in the surface went against them like every other NATO member but underneath did business with them selling laundering their petrol sales abroad, their weapon imports and became the secure pathway for fanatics from all our the world to join ISIL. What was the exchange? A small fee from the sales and the genocide of the Kurds. Actually with Turkey leading all the countries in the region have one way or another the last three decades practice a slow genocide against the Kurds. Saddam used chemicals, the Iranians used bombs, the Turks airplanes and napalm. But don’t get the impression that the Turkish people live better under the New-Ottoman Sultan. Freedom of speech even freedom of thinking is a luxury in this candidate for full membership in the European Union. A corrupted juridical system, with corrupted security forces and bureaucracy and dishonoured politicians. Actually Recep Tayyip Erdoğan is no difference nowadays than any other Middle East dictator and he survives only because he serves geopolitical agendas. Nothing more nothing less. 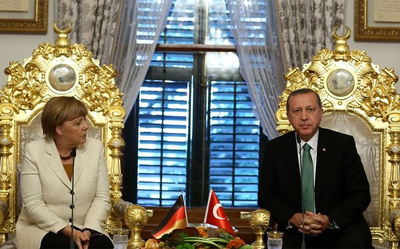 And this moment in a very Erdoğan way, the New-Ottoman Sultan blackmails the west with the refugees. The bad news? For one more time the west and especially EU fell into his demands and paid the ransoms hoping that he will keep at least a 20% of all the things he promised to do. In the meantime more refugees in suicide boats cross the Aegean Sea, more pile into camps under inhuman conditions for purely human reasons and in Finland and Hungary racists demonstrate against the …invaders who will defeat Christianity and take their jobs. Benedict Cumberbatch finished his call saying: “…as citizens of the world, we see you … and at least some help is coming.” I think before checking what is coming we have better start checking what’s awaits for them, because this is our responsibility and if it is a xenophobic, disorganized and scared continent in a hypocritical world with murderous allies and partners then I’m afraid we are in exactly the same suicide boat.